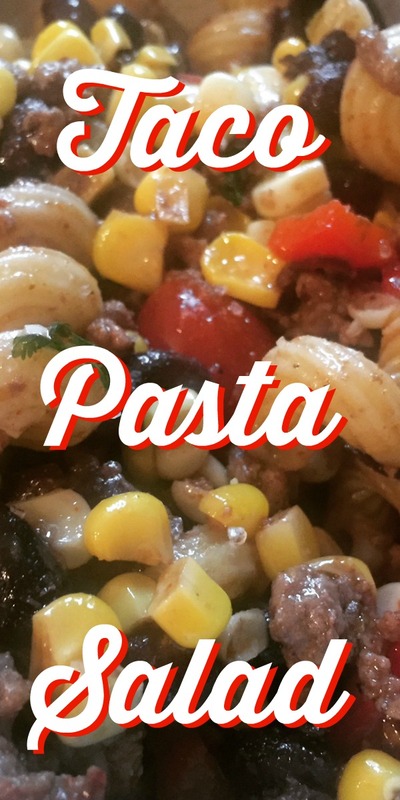 Food Hussy Recipe: Taco Pasta Salad | The Food Hussy! I'm always looking for easy recipes that I can make on a weekend and then take for a couple of days to work but I'm not always fond of cold foods for lunch. I decided to make a pasta salad that could be eaten warm or cold! I created this Taco Pasta Salad - it's basically the ingredients you need for tacos - but with pasta instead of taco shells. It's also really easy to make - so let's do it! First you mix up the dressing - it's very simple with garlic, taco seasoning, lime juice and olive oil. I shook it up in a jar to mix it. Then browned the ground beef and peppers - and in a large bowl mixed together the ground beef, peppers, black beans, corn and olives. I stirred that all together. Lastly I took the dressing and poured it onto the mixture. Toss it up and you're good to go. I like to leave it in the fridge overnight for the flavors to develop and get into the pasta. The nice thing about this pasta salad is that you can eat it cold or warm! Enjoy! Combine all the dressing ingredients in a mason jar and shake to mix. When you brown the ground beef, you can also throw in the peppers for just a couple of minutes to lightly saute them. Do not cook all the way through - just so they're not raw. In large bowl combine all salad ingredients and add dressing to mixture. Stir well to coat all the ingredients with the dressing. Refrigerate overnight. You can eat the salad warm or cold.